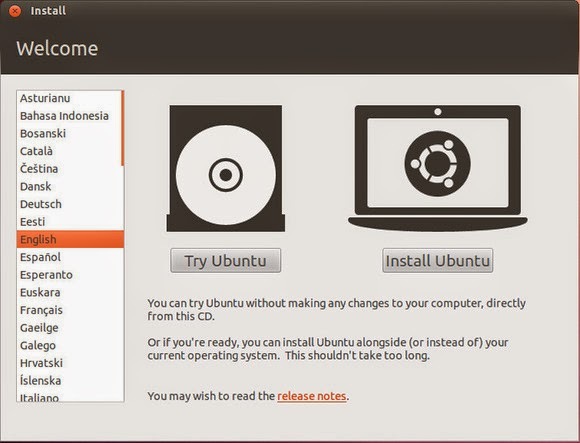 Ubuntu offers three ways to launch the operating system without destroying Windows. Two of these options require a bootable Ubuntu CD or USB drive. 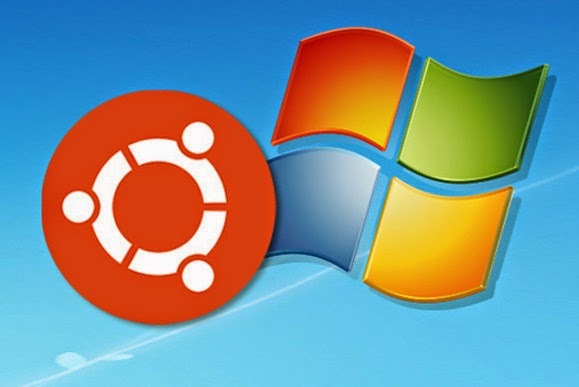 In this article we'll discuss how to set up those devices and install Ubuntu alongside Windows. You need to download either the 32- or 64-bit version (depending upon your underlying hardware) of the Ubuntu desktop ISO image file. To turn the ISO file into a CD or DVD, simply double-click it. A program should come up to walk you through the burning process. If it doesn’t, install the free ISO Recorder and try again. 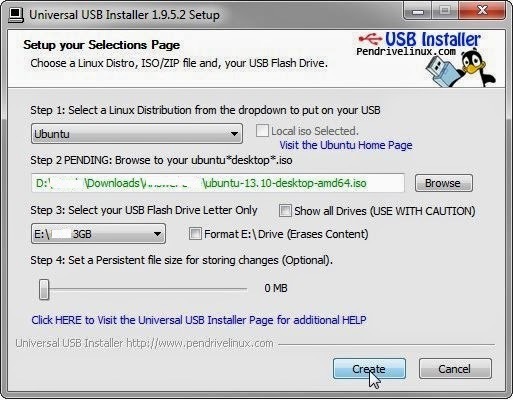 To create a bootable flash drive, you’ll need the Universal USB Installer--another free program. It’s pretty easy to use. When you boot from your Ubuntu media (whether it’s CD, DVD, or flash drive), you get two options: Try Ubuntu and Install Ubuntu. Select Try Ubuntu. This loads the operating system directly into RAM, without writing anything to your hard drive. You can try it out, experiment with the bundled applications, and surf the web. But remember that you’re booting from a static source. Any changes you make to the Ubuntu environment will last only until you reboot. It’s a limited version of the OS. This is the most convenient way to install a configurable version of Ubuntu and keep Windows. But it doesn’t work with Windows 8, or with computers that have UEFI firmware. Instead of the ISO image file, this option requires you to download and run the Ubuntu Installer program within Windows. After you fill in the requested information, it does the install, which includes a reboot into Ubuntu. When the installation is done, booting will give you a boot menu with both operating systems. Windows will be the default. If you decide you don’t like Ubuntu, you can go into Windows and uninstall it through Control Panel, just like any other Windows program. This technique will work on systems where the previous version wouldn’t. It creates a version of Unbuntu on its own partition that is not easily removed. You’ll need to boot from the disc or flash drive I discussed above. 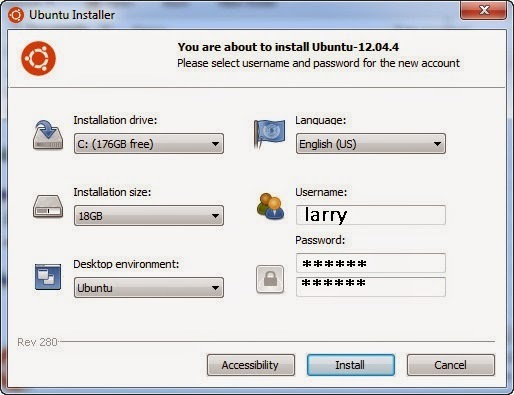 Select the Install Ubuntu option. 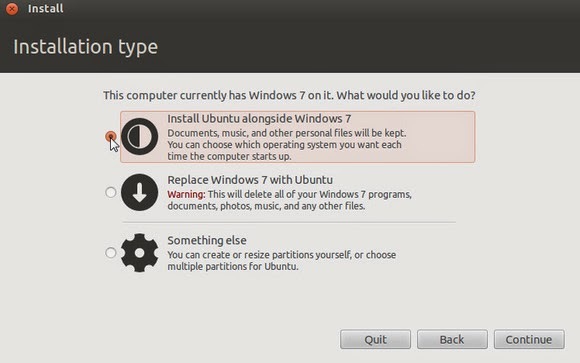 When asked later in the wizard, select Install Ubuntu alongside Windows 7 (or whatever Windows version you're using). This creates a new Ubuntu partition, installs Ubuntu there, and rewrites your PC’s boot sector. Now, when you boot, you’ll get a particularly ugly menu that allows you to select your operating system. This time, Ubuntu will be the default.